Work on regenerative medicine is not only happening in academic laboratories, novel cell-based therapies are also being developed by commercial companies in Europe and across the world. Michael Morrison, a social scientist with a focus on science, technology and innovation, takes a look at what is happening in the European commercial sector. Most of the medicines we commonly use are made by the pharmaceutical industry and are developed through techniques of traditional chemistry. However, since the early 1980s a second commercial sector, the biotechnology or ‘biotech’ industry has been developing novel therapeutics based on biological material. Biotech products include protein drugs made by genetically-engineered cell cultures, monoclonal antibodies (laboratory-made copies of a single human antibody, often for use in cancer treatment) and, most recently, human cell-based therapies. Cell therapies are treatments that use human cells, including stem cells, with the aim of restoring, maintaining, or improving the functioning of human tissues or organs. They may be used to repair or compensate for damage caused by trauma or disease. There are currently around 50 firms developing cell therapies within Europe. It is difficult to give an exact figure because the cell industry is very dynamic. Companies merge, get bought over, go out of business or change the focus of their scientific work, while new start-up firms can enter the picture at any time. The information on commercial firms discussed here was collected as part of a European Commission Framework Programme 7 project called Regenerative Medicine in Europe (REMEDiE) which ran from 2008-2011. Almost all the companies identified by REMEDiE’s research are small (having fewer than 50 employees) and most have been founded within the last 12 years, although a few survive from the 1990s and even earlier. 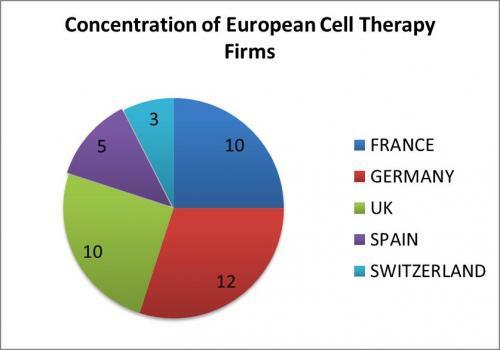 Cell therapy firms are not evenly distributed across Europe; the majority are concentrated in Germany, France and the United Kingdom. These countries all have strong existing infrastructures, including regulations and facilities, for biomedical research and commercialisation and so it is not surprising that they have also become ‘hubs’ for cell therapy within Europe. Other countries such as Spain and Switzerland have made significant investments in regenerative medicine and can be considered ‘emerging’ or secondary sites of strength in the European cell therapy field. Eastern and Southern Europe show the lowest levels of commercial activity in this area. Companies face a choice between a range of human cell types to work with when developing new therapies. These include ‘adult’ differentiated cells of the body (known as somatic cells, e.g. skin cells) and stem cells from a range of sources – embryonic, foetal, cord blood, and mature tissues. Adult somatic cells can also be reprogrammed using certain biological factors to produce induced pluripotent stem (IPS) cells: cells that behave very like embryonic stem cells and can differentiate into all the different types of cells in the body. "The REMEDiE project identified some 65 cell therapies under development in the European commercial sector...at all stages of development"
The REMEDiE project identified some 65 cell therapies under development in the European commercial sector. These are at all stages of development from early preclinical research, as with a neural stem cell therapy being developed for Parkinson’s Disease by Axontherapix S.L of Spain, through to products that are available to treat patients now such as Chondroselect®, a cell therapy for repairing damaged tissue in knee joints produced by Belgian cell therapy firm TiGenix. There are more cell therapies than firms because several firms have more than one product in development. European cell therapy firms are split almost equally between therapies based on stem cells and therapies based on somatic cells. Adult ‘differentiated’ cells are easier to obtain than stem cells and the know-how to grow and manipulate them is well established, but they are mainly used in indications with relatively limited patient populations such as wound healing and repairing damaged joints and ligaments. Stem cells have much greater potential to treat chronic health conditions affecting large numbers of people including diabetes, heart disease, neurodegenerative and autoimmune illnesses. They are also more complex to work with and can raise greater social and ethical concerns. Almost all the stem cell therapies being developed by European firms involve ‘adult’ stem cells derived from bone marrow or similar tissues. No European firms are developing cell therapies based on human embryonic stem cells (hESC), most probably because this ethically controversial technique is prohibited in some European countries (meaning an hESC-derived therapy would probably also be banned there), and because such products cannot be patented in Europe. There are a small number of private companies in the United Kingdom and Sweden supplying hESCs for research purposes. 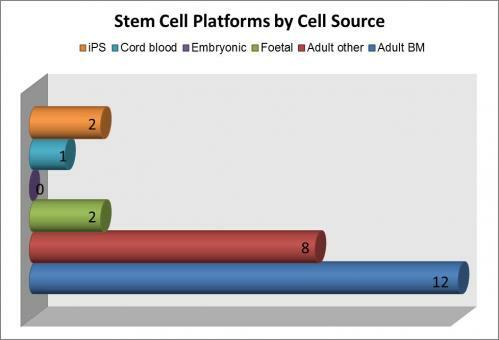 Only a few firms in Europe are currently working with foetal or induced pluripotent stem cells. Cell therapies can also be categorised on the basis of how the cells used relate to the patients being treated. Autologous cell therapies use cells derived from a patient’s own body as the basis of the treatment. This often involves the extraction of cells and an ‘ex vivo’ (outside the body) step of growing and multiplying the cells, using a particular medical device or protocol, before transplanting them back into the patient. In a number of ways this process resembles an individualised surgical procedure much more than a drug therapy aimed at a particular patient population. In contrast to this highly individualised model of cell therapy, allogeneic cell therapies aim to develop an ‘off the shelf’ cell therapy product which uses cells derived from a single donor. These cells are treated and grown in culture to give a ‘biomaterial’ that can be shipped to multiple sites and implanted in patients unrelated and unconnected to the original donor. This approach treats cell therapy products as much closer to conventional drugs in that one product is suitable for a comparatively sizable population. It has been argued that allogeneic cell therapies offer a much greater scope for profitability than autologous approaches because a patient’s own cells cannot be patented or sold to them, whereas an allogeneic cell product can be patented and sold on a ‘fee per unit’ basis like a conventional pharmaceutical product. Allogeneic cell therapies are often perceived as more risky than autologous ones. This is because allogeneic therapies involve transplanting modified ‘foreign’ biological material into the patient’s body, which carries a greater risk of immune rejection and requires greater use of immune system suppressing drugs than therapies using material from the patient’s own body. However, the nature of this divide is not universally accepted. Immunological work has suggested that cells and tissues that were thought unlikely to cause an immune response, including autologous cells and hESCs, can still present transplant rejection problems. In many ways the development of the European cell therapy sector can be seen to parallel the development of cell science itself. The oldest and more basic commercially available therapies are in the form of ‘tissue engineering’ applications using ordinary adult cells to treat highly specific conditions. They draw on understandings of basic human cell culture and techniques for growing cells developed in the 1980s such as culturing skin cells to treat burns and small wounds. Cell therapy products in development show a much greater investment in novel stem cell science, designing new products aimed at treating widespread, chronic and often incurable diseases. Many major advances in stem cell science have been made since the cloning of Dolly the sheep in 1997 and the successful culturing of human embryonic stem cells by James Thompson’s research team at the University of Wisconsin in 1998. Nevertheless, the majority of commercial stem cell therapies are still in the early stages of development and it is likely to be some time before we see any of these products on the market. While these products are more ambitious, they are also more complex and make for a more risky business investment. "Developing a cell therapy is a long and difficult process and companies rely on securing investment based on the promise of what their product might do while it is still in the development stage"
Like any other industry a commercial cell therapy product must make financial as well as medical sense. Most small biotechnology companies are heavily dependent on investment from Venture Capital (VC) firms and occasional support from wealthy individuals known as ‘Angel investors’. Developing a cell therapy is a long and difficult process and companies rely on securing investment based on the promise of what their product might do while it is still in the development stage. Investing in a cell therapy company is seen as a high risk proposition and new firms often look to attract investors by lowering the riskiness of their business model. Hence, in Europe at least, stem cell companies have opted to work with better characterised, less ethically problematic adult stem cells while avoiding hESCs and only beginning to invest in induced pluripotent stem cell technology. 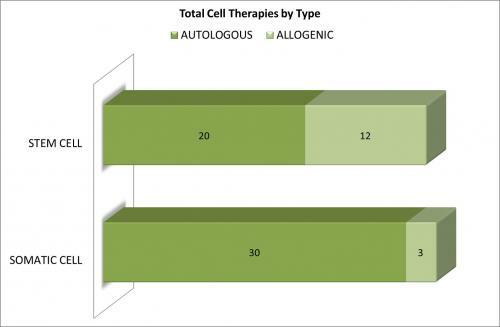 In terms of the choice of cell delivery models, while allogeneic cell therapies are felt to be viewed favourably by investors as a long-term goal of regenerative medicine, the development and standardisation of large-scale cell culture for clinical use presents significant technical and regulatory challenges for allogeneic products in the short to medium term. It may be that developers intuit that smaller scale hospital-based delivery of autologous cell therapies to individuals and small groups of patients will be the most readily available mode of delivery for cell therapies for the near future. Professor Julie Kent of the University of the University of the West of England (UWE) has also suggested that the sense of ‘self-repair’ involved in autologous cell therapies is more in keeping with European culture and ethics than allogeneic therapies. European value systems have traditionally rejected commercialisation and commodification of the human body and its parts, which could be seen as an outcome of the allogeneic approach. As this short overview has illustrated, the development of new cell-based medicines in the commercial sector is both promising and risky from a business perspective. The complex issues of what type of cell therapies we might see in the future is shaped not only by scientific and technical considerations, but also by regulatory, ethical, cultural, economic and historic factors. Lead image © iStock/Jovan Jaric.